Tindale Dental - Penrith Dentist > Articles > Article > What’s in a tooth? Last month we talked about the 4 different types of teeth, this month we’ll look at what makes up a tooth. Firstly, what are the parts of a tooth? There are two basic parts that make up a tooth: the crown, this is the first part of the tooth to develop and appear. Ideally, it will be the only visible portion of the tooth. The second part is the root, which is generally hidden below the gum line. It helps to anchor the tooth into the bone of you jaw. What are your teeth composed of? Enamel – the outer, protective covering of the tooth. This portion of the tooth is actually harder than bone, allowing it to perform the function of protecting the tissues that lie within the tooth. Enamel is composed of hydroxyapatite, phosphorous, and calcium. Dentin – this layer is directly under the enamel, and has a similar appearance to bone. It is not quite as hard as enamel, therefore, if the enamel should be worn away the dentin will be left exposed to a greater risk of decay. Cementum – this is the tissue covering the tooth root, it helps with anchoring the root into the bone. Its tissue is softer again, which is why it’s important to take care of your gums, as they cover and protect this softer tissue from decay. If the gums are not cared for properly, they can begin to recede, leaving the cementum exposed to harmful plaque and bacteria. Pulp – making up the core of the tooth is the pulp. 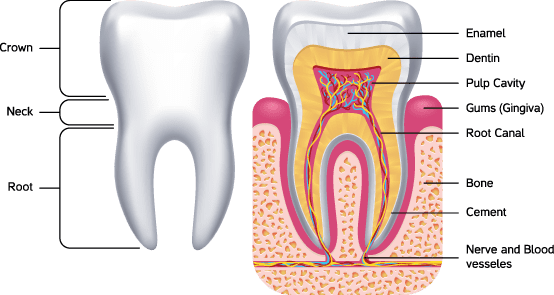 This portion of the tooth houses the blood vessels, nerves and other soft tissue responsible for the distribution of nutrients and signals to your teeth. To ensure that you are maintaining the health of the whole composition of your teeth schedule an appointment with our experienced dental team at Tindale Dental, Penrith. Call us today on (02) 4726 5400 and let our friendly team take care of your oral health.